The Design of your Home or Office should be a Pleasant Journey, We make that Happen! GBG Interior Designs has the expertise to manage all phases of the interior design process and provides a professional and positive experience. Whether the total renovation of your current home or the revitalization of your office or retail space, our goal is to lead you on a journey to the interior design of your dreams. New Home Consultation: Our expertise helps you to find the design potential within the framework of a new home purchase. Home Staging: Selling your home? Hosting an event? 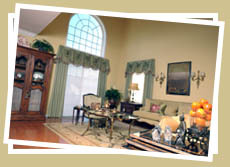 Let us prepare your home while you focus on something else important. Eco-Friendly Products: GBG Interior Designs is proud to support green initiatives by featuring a full range of eco-friendly products, including carpeting, paint, fabrics, accessories and lighting. Please contact us today to find out more. Field Supervision: Consultation with architects, engineers and hands on supervision with all contractors and support trades.